After years of animations production, Robert Zemeckis returned with an action film called “Flight” in 2012, depicting an alcoholic pilot of a passenger plane whose crash sets a chain of events forcing the pilot to confront his addiction. After the crash, Captain Whip Whitaker (Denzel Washington) befriends another drug-addict, Nicole (Kelly Reilly), and with her and his loyal colleague Charlie (Bruce Greenwood)’s emotional support plunges into a post-crash legal battle of guilt-and-responsibility-shifting, while alternating between increased drinking and complete abstinence. As an airplane disaster film, “Flight” is solid and this is for a number of reasons. It has a great character study. Captain Whip Whitaker is a man who has a problem – he is an alcoholic. However, he also has chosen a profession that does not tolerate even a hint on alcohol-consumption, let along dangerous risk-taking. As the film progresses, Whip transforms from a reckless, proud man whose only concern is good time to a person who recognises the enormity of the responsibility entailed by his profession, the errors and wrongs of his addiction and the need to pay respect to people around him. Whip recognises the fact that his actions may have consequences affecting others. In that way, although it is hard for many to relate to Whip and his addiction, the audience also feels a lot of sympathy for a man who strives hard to turn his life around. In part, this is due to the excellent acting by Denzel Washington, who commands respect and admiration, being very sympathetic and charismatic, even though he also plays a character who is damaged and controlled by his weaknesses. Then, Denzel Washington is just great in this role. As in ‘“Déjà vu” (2006), here he plays a character who is torn between professional obligations, and emotional attachments and personal problems. The transformation of Denzel into a strong man, privately combating his shameful addiction is mesmerising to watch, and Washington really deserved his Best Actor Oscar nomination. He is also surrounded by equally good supporting cast. Don Cheadle (“Hotel Rwanda” (2004)) shines as an attorney who wants to help Whip face his legal battle; Bruce Greenwood, as Whip’s colleague Charlie, is also good, being truly sympathetic to Whip’s problems and concerned about his future career, and the female support cast includes Nadine Velazquez, Tamara Tunie and Kelly Reilly, who are all equally convincing. Considering other alcohol-addiction films, such as “Leaving Las Vegas” (1995) and “When a Man Loves a Woman” (1994), it may be said that “Flight” does give justice to the realism of a situation wherein a person battles with a long-term addiction. Moreover, the background on which this addiction is played out in “Flight” is fascinating in itself – the life of an airline passenger jet pilot. Other great things about this film are its opening and closing scenes. The opening scene, showing the plane crash, is very intense (though somewhat lacking in realism). And, as we are about to think that the film slides into something ordinary and predictable towards the middle, we have a ‘legal’ culmination of the story which is satisfying and enjoyable. The ending almost reminds of the closing scenes of another film dealing with the ‘drug’ problem – “Blow” (2001), where the inspirational effect of the film is reinforced by the next generation’s realisation of a person’s achievements. One of this film’s main weaknesses is the presence of scenes and sub-plots which do not really come together or work-out well. Parallel to Whip’s life fuelled by alcohol and post-crash legal consequences, we also follow the daily life of Nicole, another drug addict. Although similarities and differences between the two characters may be interesting to watch and compare, it is annoying at times because the film cuts back and forth, sometimes in the middle of very intense scenes. Other scenes which demand to be cut include characters which Whip meets at the hospital, as well as Nicole’s friends at her group support meetings. Some scenes are also filled with almost soap-opera-like melodramatic undertones which appear even more annoying, seeing that “Flight” is so lengthy. Nice review. 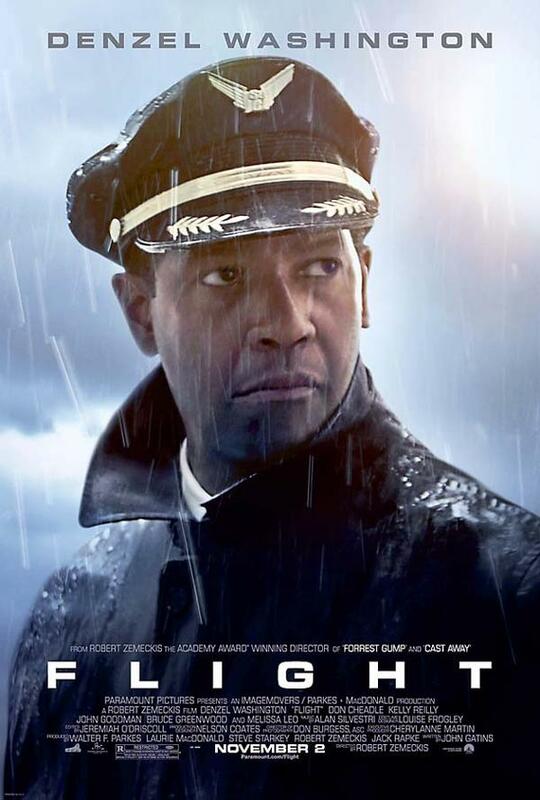 I really enjoyed Flight, I thought Denzel was brilliant. I thought the ending was a little unnecessary and his girlfriend seemed a bit of a needless character but other than that I thought it was great. Thanks! I agree about his girlfriend. Even if there is a decision to include her, in a way, she shouldn’t have had so much screen time. I think that in this film she partly plays Whip’s ‘conscience’, and through her Whip realises the extent of his problem and also draws inspiration from her to get better, because she does everything to do it, e.g. going to meetings and landing a steady job. Good review. Denzel is the anchor to this movie. Even when it begins to get obvious, weepy, and conventional, he’s the one who keeps it spiced-up and moving. They totally screwed up the marketing for this film. Denzel gives a real powerful performance, even more so if you happen to know any alcoholics. Also loved John Goodman in this film.